This 7 inch GPS navigation has 7 vehicle modes between Car/ Truck/ Pedestrian/ Bicycle/ Emergency/ Bus/ Taxi. Customize better routes for you and avoid roads such as width/height/weight restrictions. And Providing Intelligent current speed camera alerts, sound warning and route planning, telling estimated arrival time. 2D/3D map view mode. Pre-installed with the most up-to-date 101 regions maps in United States/ Canada/ Mexico, provide with lifetime free map updates. If you need to update the map or want other countries maps, please contact us to download. 8 GB ROM 256 MB RAM provides plenty of room to start and operate quickly; which also ensures high speed and perform smoothly, say goodbye to the freezing and buffering. 1500 mAh battery supply. 7 inch HD screen, 800 * 480 resolution, more clearer and sensitive. The screen color feels natural and comfortable for your eyes. Provide real voice broadcast with over 40 languages. Support FM broadcast, MP3, MP4 player, video player, pictures, games and pocket calculator. Notice: FM not mean FM radio, but for transferring the gps sound to your car. 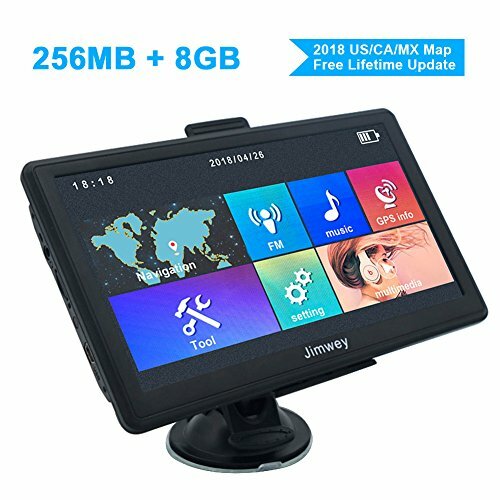 Comes with ①GPS Navigation with CE & RoHs Certificate ②Car Charger ③USB Cable ④Suction Cup Mount ⑤Back Bracket ⑥User Manual; With 1 year warranty and 90 days money back guaranteed, you are guaranteed with a great quality of after-sales service.